CAMAS — It was not a typical highlight. Not for an MVP at least. Haley Hanson had the ball for a few seconds in one possession during Camas’ victory over Union in the Class 4A Greater St. Helens League tiebreaker game last week. She passed the ball to a teammate, then ran around a couple screens, trying to get open. She kept running, but on this play, her opponent was with her every step. There was no way Hanson was getting the ball back on this possession. No way Union was going to allow her to score on this play. With the defense so focused on Hanson, another Papermaker found herself wide open. The ball got to Jalena Carlisle, who drained a 3-pointer, giving Camas a 14-point lead. Hanson’s face lit up. She was so excited for her teammate, for her team. It meant nothing to her that she never got the ball again that play. She did her job, attracting the defense. And her teammates did their job, finding the open shot. Haley Hanson was voted the league’s Player of the Year. She also has turned into the leader of the year for the Camas Papermakers. She embraced it this season, her senior year, on what is essentially a new team. Camas graduated seven seniors last year. This is Thompson’s first year at Camas, but he knew of Hanson’s abilities. She has been a varsity player since her freshman season. This season, the coach has been witness to Hanson becoming the positive influence every team needs. “She is an absolute star, but she also is a great teammate, a great family member,” Thompson said. 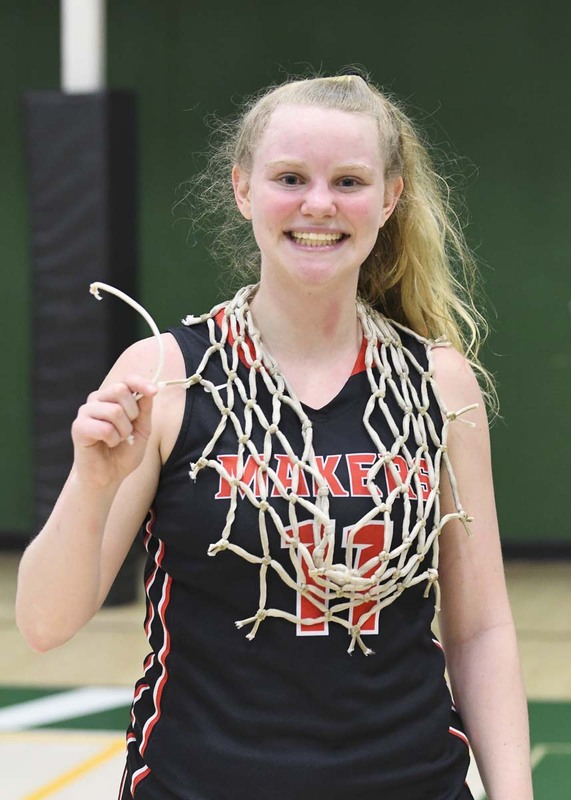 Hanson helped her family win a share of the league title with Union — Camas earned the top seed to the postseason via the tiebreaker win — this season. It is the third consecutive league title for the Papermakers. “We have set a standard,” she said. She was not so sure that standard was going to be met, though. Camas just happened to win another league title. “Now I’m hoping we play at state,” Hanson said. Hanson said she is not feeling any pressure, any stress, going into the playoffs. It is her final year of high school before moving on to play at Northwest Nazarene in Nampa, Idaho. She believes she is playing at her best right now. The coaches of the 4A GSHL agree. They voted her the league’s Player of the Year. “It’s cool to work up to this, your senior year, and to say, ‘You’re the MVP,’” Hanson said. It is an individual honor in a team game, though. Hanson has the skills to take over a game — she connected for eight 3-pointers in a game earlier this season — but she would rather play within the team’s system. That might require her to go for 20 or more points one night. Or it might mean being a decoy on offense, working hard on defense, and leading to victory without scoring a bunch. Just like in the tiebreaker game last week. 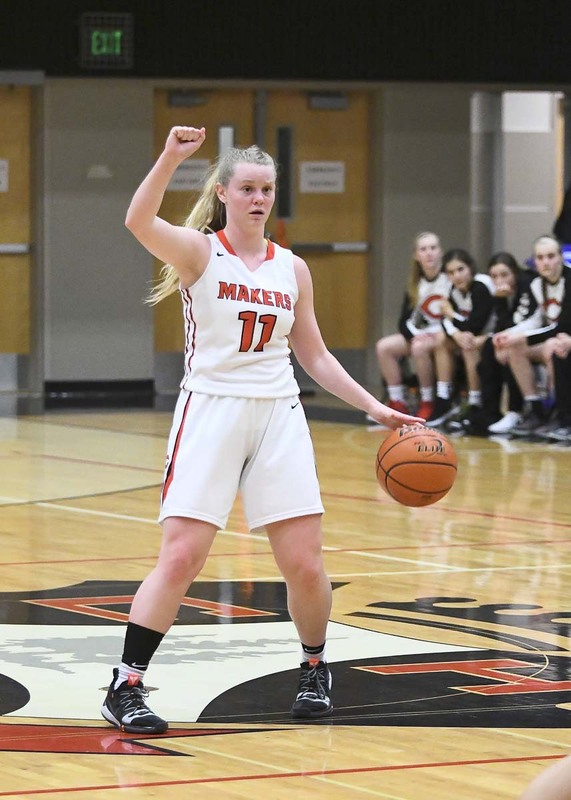 Hanson is the leading scorer on this team, but she is more about leading the team to success, leading the team by example, showing the next wave of talent at Camas how it is done in this program. That is her final role in high school basketball.